Pub and restaurant in Caterham, offering Indian food including Indian versions of Chinese food. 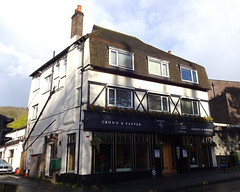 It opened in November 2016, and has a (longer-standing) sister pub in Croydon. This one is somewhat smarter than the Croydon version, with a lounge-like armchair area at the front leading back to a bar with dais seating opposite and finally a restaurant area at the back. Decor is in shades of brown and cream. Kake and friend visited on a Saturday evening in April 2017. It was relatively full when we arrived around 5:15pm, but there were still a couple of free seats even though the dais area and the restaurant area were both booked out for private parties. Music was playing, not too loud. Only one of the three handpumps was on, offering Deuchars IPA (£3.60/pint), but it was in good condition and we had a couple of pints of it each. Service was friendly. Due to the restaurant area being booked, they were only offering their so-called "tapas" menu, from which we ordered three dishes to share. Crispy okra (£5.75) photo was very good. The batter was thin and crispy, and remained crispy to the last bite, and the seasoning was spot on. Chilli mushrooms (£5.75) photo were also good, with a nice balance between sweetness, saltiness, and spiciness, and a juicy texture; the portion did feel a little small for the price, though. Given the quality of these two dishes, the mogo masala (£6) photo was very disappointing — chewy and tough, to the point where we left almost all of it. Accessibility: No steps to get in, and there's an accessible toilet on the ground floor. Some of the seating is on a dais, but there's a reasonable amount on the level, and access to the bar is also level. Other toilets are up a flight of stairs with a landing and turn in the middle and a sturdy handrail all the way up. Last visited by Kake and friend, April 2017. Opening hours taken from Facebook page, April 2017. Last edited 2017-09-06 12:37:07 (version 3; diff). List all versions. Page last edited 2017-09-06 12:37:07 (version 3).